This past week we had some really heavy rains. I had my camera setup so I could photograph birds out of my front window but wasn’t able to do so because of the heavy rain pounding against the window. As things began to clear a bit I decided to try some art photography using the raindrops as a focal point with the subject blurred in the background. I had a very limited subject selection from my front window. The photo on the right is a fence post taken through my front window after the rainstorm. 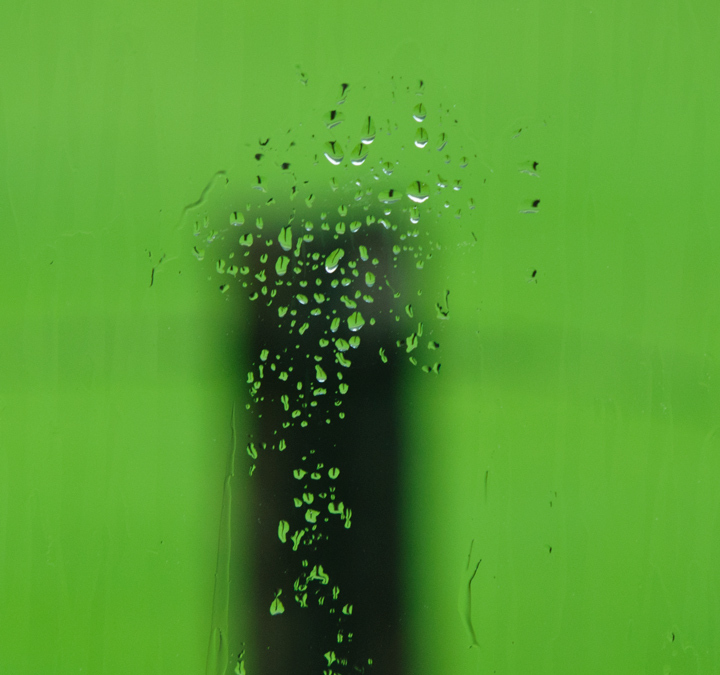 That got me to thinking that it might be fun to photograph other things using the raindrops on plastic/glass. Unfortunately there just aren’t that many things I can photograph through the windows and it is dependent upon the rain hitting the window just right. I decided it might be fun to try and create some raindrops on a small piece of plastic/glass that I could attach to something and move it around the farm where I could find a variety of subjects. After some thought and a little experimentation I came up with a list of supplies that you will need. Clear Plastic or a small piece of glass – I needed something to simulate the window glass. For this I already had some things around the house. For the glass I removed the glass from an old picture frame. For the plastic I had a small piece of sheet plastic left over from repairing my bird feeder. The plastic can be purchased at a local box store. Glycerin -I stopped at my local pharmacy and purchased a small bottle of glycerin. When added to water the glycerin provides greater viscosity so the water adheres to the plastic/glass and keeps its shape. Distilled Water – I wanted some water without contaminants, we have very hard water, so I used some of my wife’s distilled water. Post – I needed something to attach the plastic/glass to. I looked around and came up with an electric fence post which was light, had a flat surface to hold the plastic/glass and was easily transportable. I typically use these to hold props for my bird photography so they were handy. The big advantage of them is that they have spike and step-in flange at one end so they are easy to stick into the ground. Since I was going to be shooting in my local prairie area this would allow me to easily move it around and easily adjust the height of the plastic. Clamps – I also needed something to hold the plastic/glass to the fence post so I grabbed a couple of plastic spring clamps from my shop. Small Spray Bottle – I found an old medicine spray bottle that was just about empty so I used that. You can also purchase a small spray bottle at your local Walmart. Small Paint Brush – Used a small 1 1/2 inch paint brush to occasionally brush the water glycerin combination once it was sprayed on the plastic/glass. I did this occasionally to create different patterns. Paper towels – I kept some paper towels handy to clean up the mess and I used them to handle the plastic/glass so I didn’t get finger prints on it. Band Aid – I cut myself on the glass. 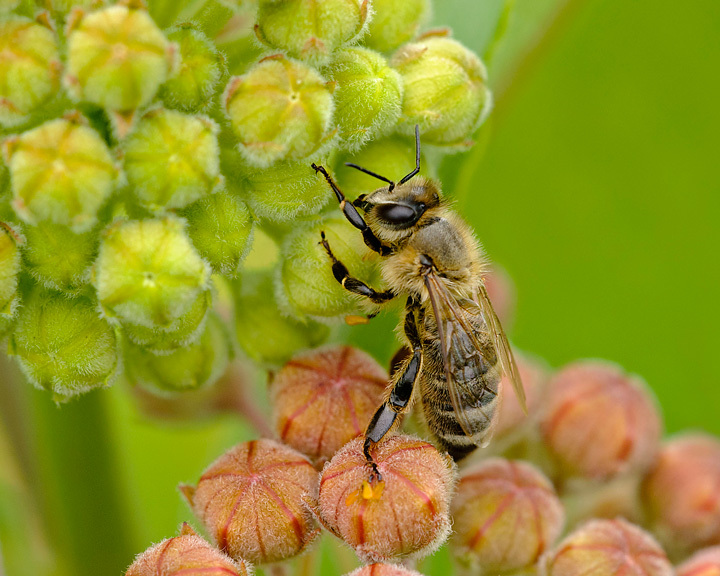 Camera Gear – I used my Nikon D80s Digital SLR and my Tamron 28-300mm lens as well as my Sigma 150mm macro lens. With all of my supplies in hand I decided to give it a try. I mixed some glycerin with water in my small spray bottle. The amount of glycerin you use will depend upon the effect you want to create. The more glycerin the thicker the mixture on the glass. A mixture of 1/4 glycerin and 3/4 water sprayed on plastic creates nice rain water droplets. You can change the combination to create different effects. I used the small paint brush drag over the glycerin/water on the plastic. This allowed me to create different effects on the plastic. I initially used my fingers but that got messy in a hurry and I ended up with some glycerin on my camera. Hence the suggestion for using a paint brush and having a paper towel handy. The subject matter is wide open. I started looking around my yard for subject that might make good photos and have some color. At this point in time the colors were rather limited but I decided flowers would be a good subject. I have a variety of wildflowers booming in my small prairie area around the house. If you can find a combination of flowers with multiple colors it makes for an interesting photograph. I placed the plastic setup a few feet in front of the flowers. I then sprayed the plastic with enough spray to create the look I wanted. I set the camera at manual focus and opened the aperture to created a small depth of field. 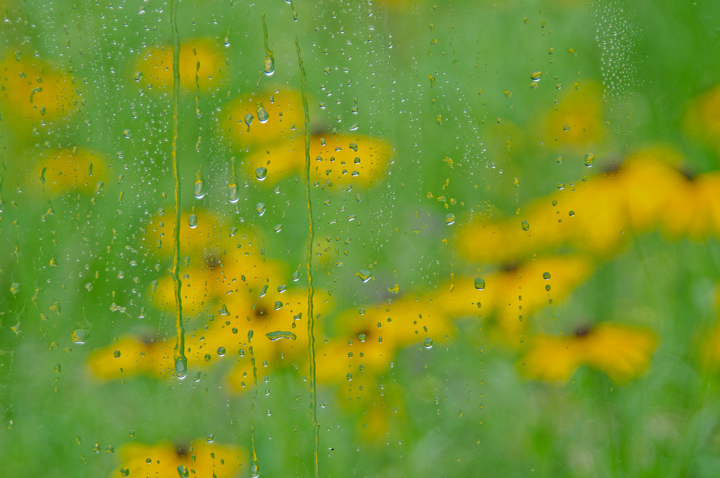 I then focused on the raindrops blurring the flowers in the background. I experimented with a variety of combinations of aperture settings, placements of the plastic and distance between the camera and the plastic. The photo on the right shows the complete setup and the photo on the left shows the plastic clamped to the electric fence post. One of the problems you need to deal with is reflections. I tried to photograph on a cloudy day to help reduce reflections. Since I normally photograph flowers on overcast days this worked out well. Unfortunately the weather didn’t always cooperate and what started out cloudy sometimes turned into bright sunshine. I also discovered that wearing dark clothing without any logos or writing on it helps so that if there is a reflection it produces a uniform reflection that is not distracting and does not appear in the photo.. 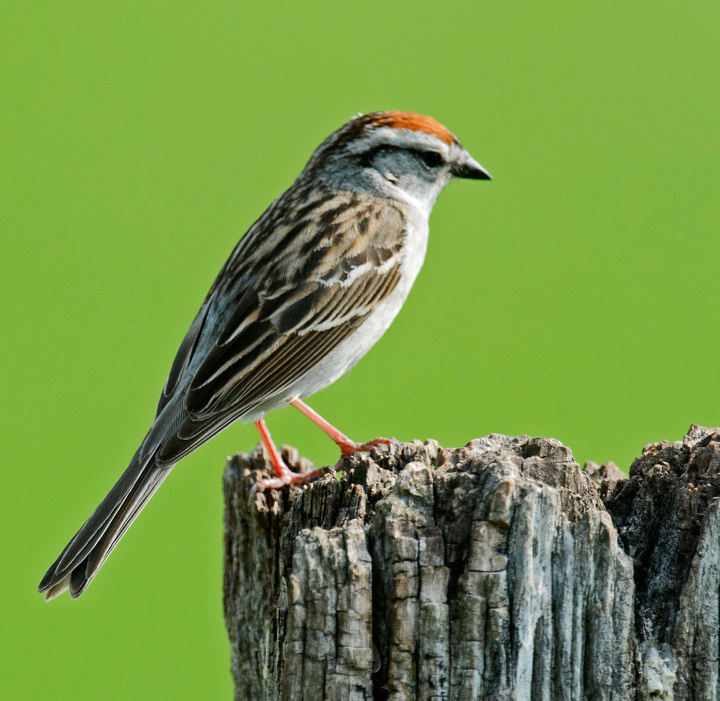 These tips I brought over from my experiences photographing birds through my windows. I tried both plastic and glass. Spraying on the different surfaces seemed to produce slightly different effects. Both worked. I was concerned about the glass breaking when I took it out in the field. It was also a little heavier than the plastic. The plastic won’t break but it scratches very easily so you will need to protect it. I ended up using the plastic because it is very portable, not likely to break and I can’t cut myself on it. 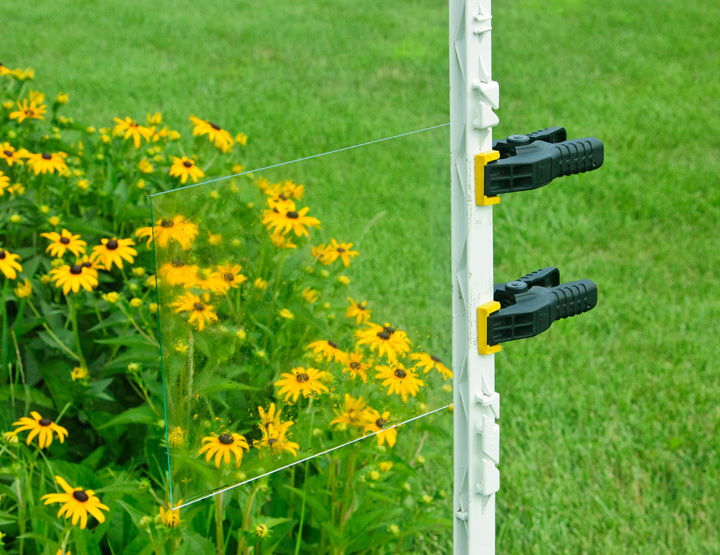 This project is best done on a day when the wind is not blowing since the plastic or glass tends to move around when using the electric fence post. If you use something more substantial you won’t have as much of a problem. I found that I could move the setup around and the water/glycerin droplets stayed on the plastic so once I had the effect I wanted I could continue to use it. I tried a variety of lenses. The photo taken from my front window was taken with a Tamron 200-500mm lens. Outside I used my Tamron 28-300mm telalphoto lens and my Sigma 150mm macro lens. The photo on the right was taken with my Tamron lens and the photo on the left with my macro lens. As I continued to experiment I found I was using my macro lens most of the time. Just remember whichever lens you use you need to open the aperture to create the right depth of field. That’s all there was too it. The best part is that the setup is portable enough to move around so I can take it along with me to other locations and do some photography. 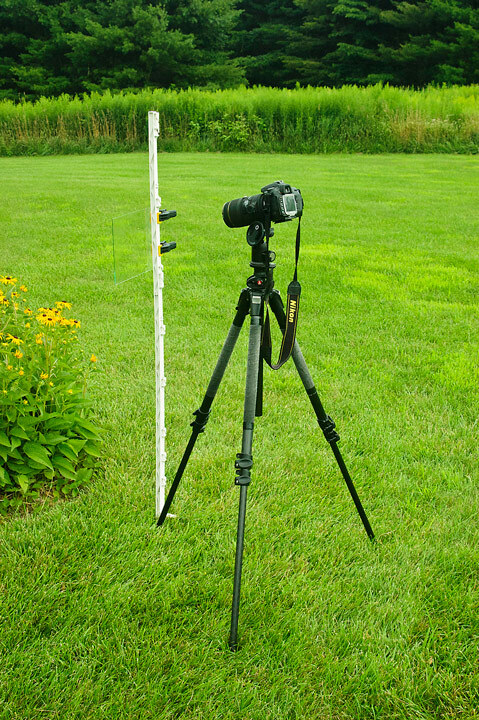 I do a lot of shooting at a local recreation area with a large prairie so I plan on taking my setup on the road. 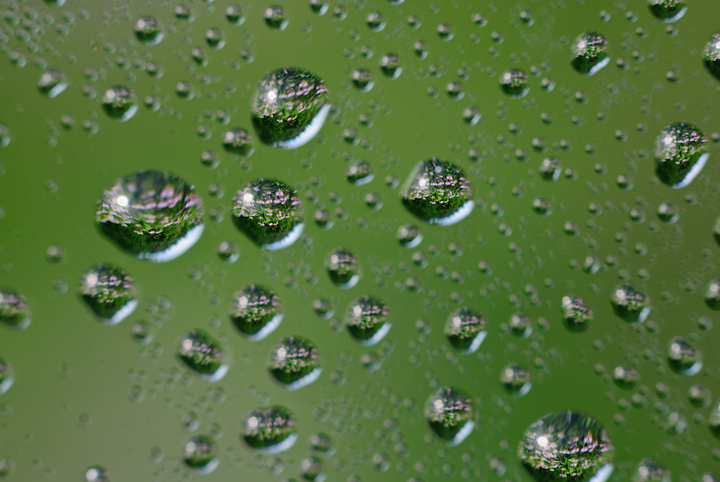 I’ve only begun to experiment with portable raindrops so you will likely see more photos in the future. 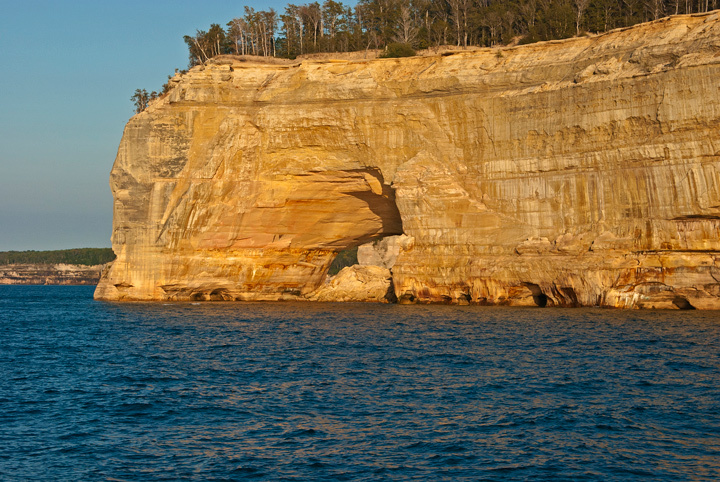 The Pictured Rocks National Lakeshore Boat Cruises out of Munising, Michigan are one of the better cruises on lake Superior. 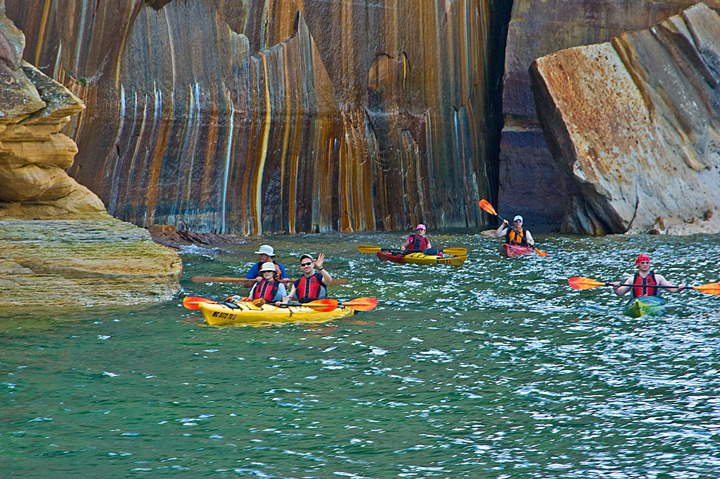 The trip is outstanding and offers spectacular views of the rock faces along Lake Superior. 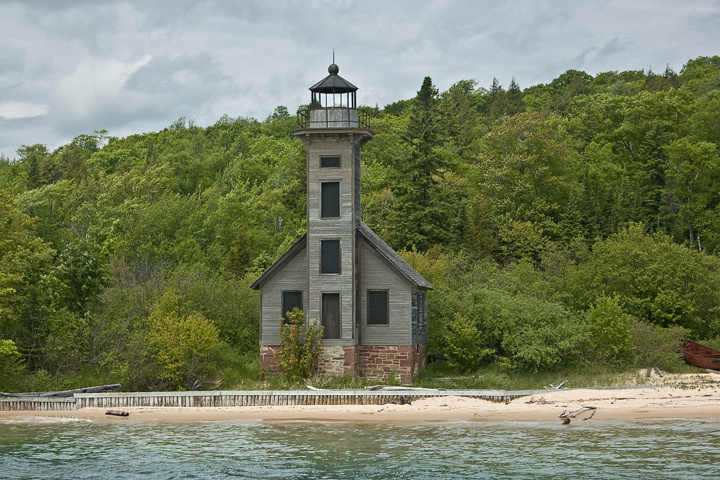 Viewing Pictured Rocks National Lakeshore from the water is the best way to view the outstanding scenery of this area and the only way you can truly appreciate where the name came from. In addition to the cruise line you also have the options of renting a boat or kayak or charting a boat. The cruise line is the most convenient but the other options give you more flexibility particularly for photography. Since I’ve only taken the cruise I’ll confine my comments to the boat cruise. I’ve made the trip several times one time taking a late morning cruse and another time taking the sunset cruse. 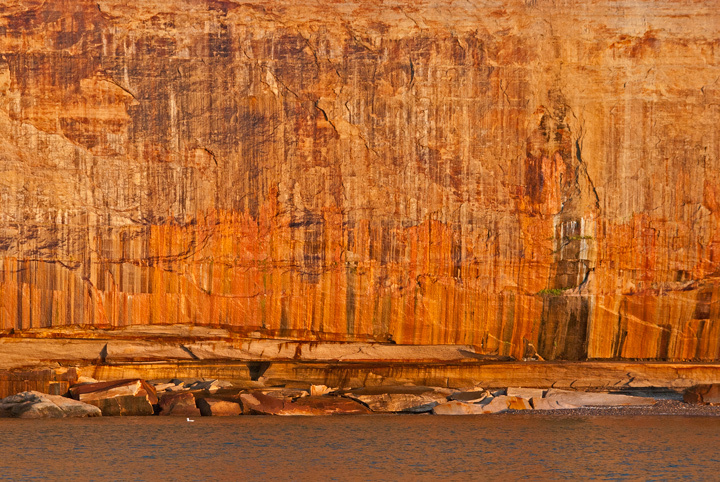 Since I’m a photographer I would highly recommend the sunset cruse because you will see the rocks at their best when the golden light of sunset hits them. 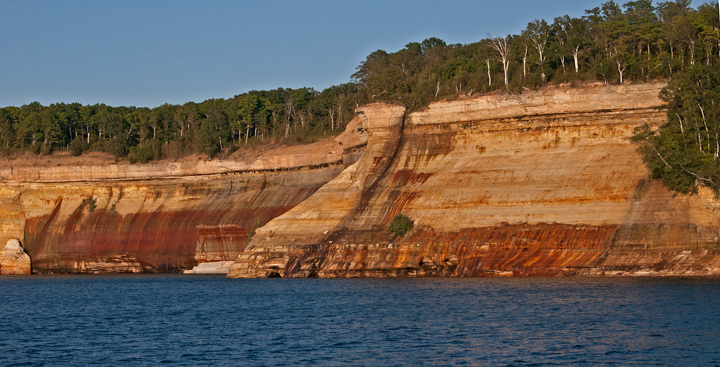 The Pictured Rocks coastline faces northwest so they will get the best light from June through August. Fortunately this coincides with the cruise line schedule. The photo on the left was taken on the morning cruise and the photo on the right on the afternoon cruise. What a difference the golden light makes. If you are interested in photography you will want to be on the right side of the cruise boat. If you want to sit in the upper deck, which everyone seems to want to do, you will need to arrive at least 30-45 minutes before the cruse starts so you can be assured of getting a seat on the railing. You might want to check with the cruise line to see when you should arrive since some times are busier than others. The seats are bench seats so you will want to be seated on the railing since this is about the only seat that will assure you of a good seating location for photography. The cruise line does not want you to stand up so if you are not on the railing it will be difficult to photograph when you are trying to photograph over and around other passengers. Being on the right is particularly important on the sunset cruise because the light will be the best on the way out. On the return trip you are likely to lose the golden light and the boat seems to be going a little faster on the way back. There are several other things to consider. If you want to photograph Spray Falls there is only one cruise each day that goes to Spray Falls and this is not the sunset cruise. You may want to check with the cruise line or park service to determine the amount of water coming over the falls when making your choice of cruises. 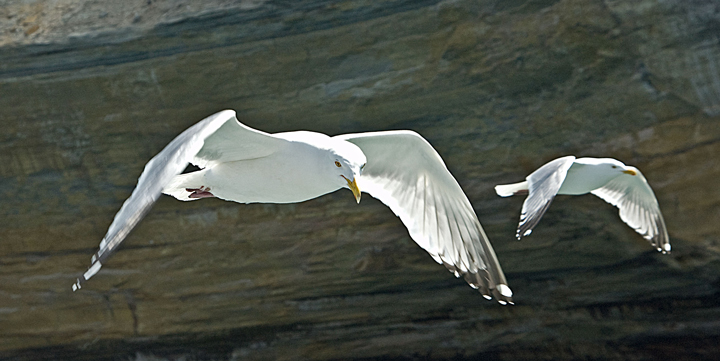 On the day cruises the staff feeds the seagulls on the return trip. This is done from the back left side of the top deck. It is not a difficult choice if you are a photographer because the sunset cruise is the only cruise that offers the golden light. The East Channel Lighthouse is also on the cruise. As I recall on the morning trip the boat goes past the lighthouse on the way back and on the sunset cruise it goes past the lighthouse on the way out. In either case the boat turns so that everyone can get a view of the lighthouse. I probably shouldn’t reveal my strategy but I like to stand o the fantail of the boat rather than pick a seat. This allows me to photograph without obstructing anyone’s view while having a great view myself. I also like to stand at the top of the stairs to the upper deck and photograph this also gives a great view. Not taking a seat allows me to move around to a variety of locations to pick the best place for photography. This is a topic I would never have though I would be blogging about since I’ve never photographed in weather that was humid enough to cause problems with my camera gear. That is, until yesterday when I walked out of the house to take a photo and my lens fogged up. We have been and will be having extremely hot and humid weather for the next few days. Humidity can create havoc with your camera lenses and electronics and it will not be covered under warranty. The camera is not designed to work in high humidity environments so you need to take steps to protect it from high humidity. Given the humid conditions outside I decided it was prudent to take some precautions to protect my gear. Thankfully my house is air conditioned but it also means that the camera gear is going to be cool when taken out into the hot humid weather. Since I do a lot of photography from inside and outside my house I took a page from my Winter Photography Tips and put my camera gear in a plastic bag with most of the air removed from the bag. When I’m ready to go out to photograph I move the camera outside for more than an hour so it can acclimate to the humidity. When I’m done shooting for the day I reverse the process and place it in a plastic bag before bringing it back into the house. You can also place some rice in the bag. This will help absorb and excess humidity. The car also presents a problem. Most likely I’m going to be driving around with the air on full blast and it is not possible to wait for the camera to acclimate to the humid weather. If I’m going to be stopping periodically to take photographs I drive without the air. Not the most comfortable option but one that prevents condensation problems when I exit the car. 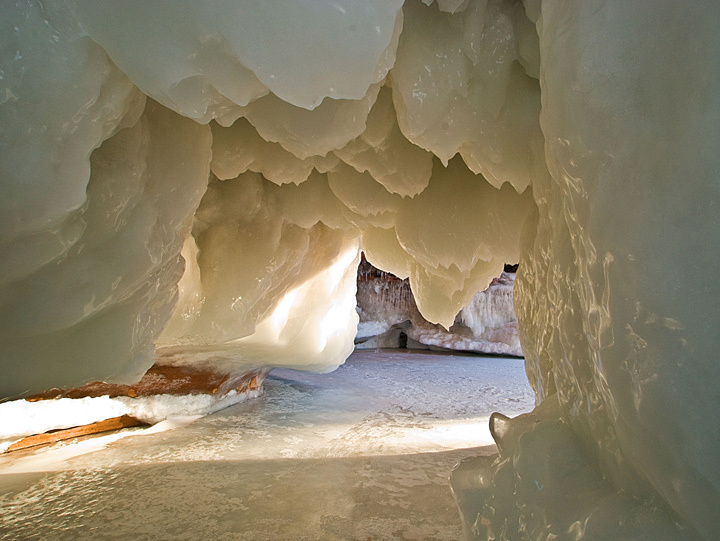 With the record hot weather we have been having I’m getting an unusual number of hits on my website targeting the Apostle Islands ice caves. 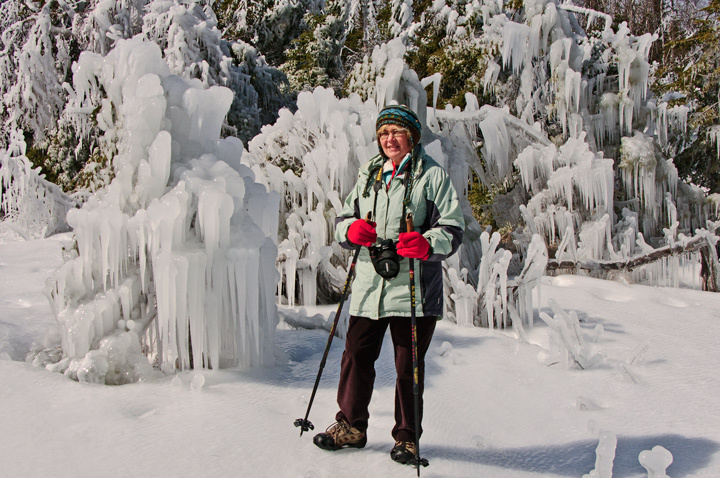 Apparently some folks are longing for the cool weather of winter. 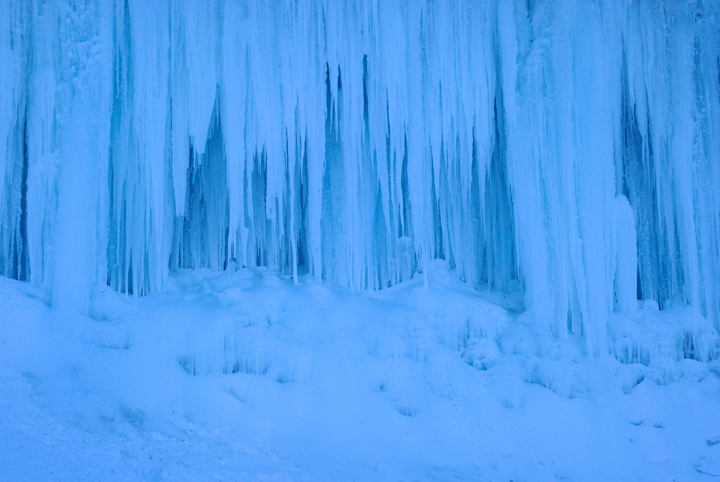 Even I have looked at the ice cave photos in recent days trying to keep cool. In addition, my TV viewing for the past several weeks has consisted of Ice Road Truckers, Ice Pilots, Extreme Ice Logging etc. You get the picture I can’t wait until we have a good old fashion blizzard. 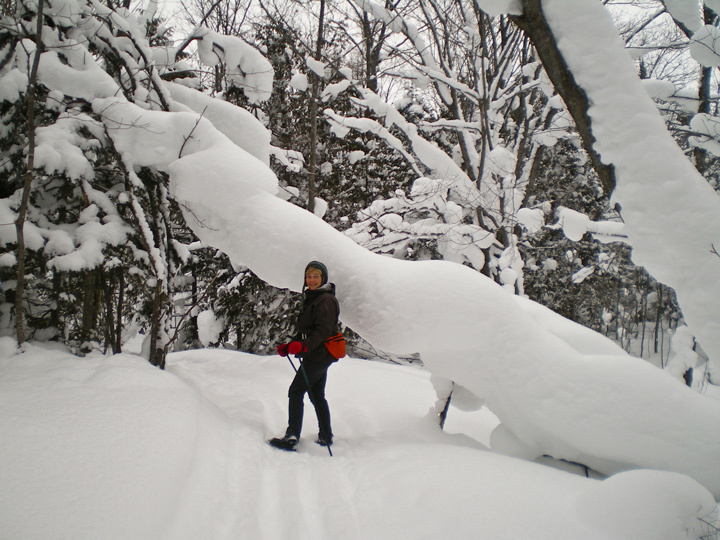 Here are a few photos to help remember the good days of winter. 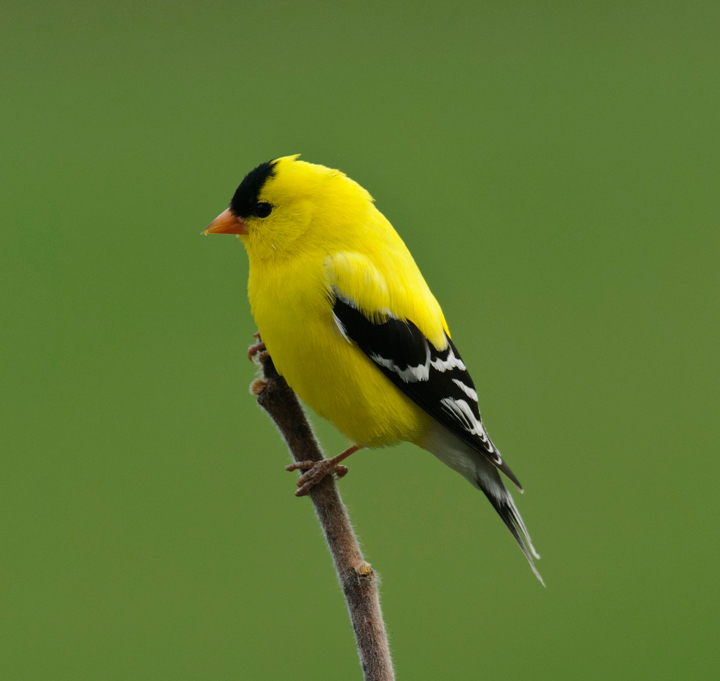 This has been an amazing spring for bird photography around my farm. 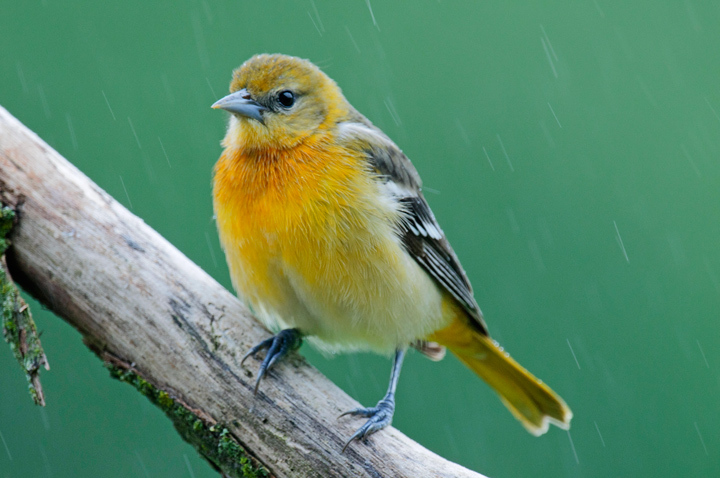 First I had more Baltimore Orioles than I’ve ever had. One appeared and then a few days later I had as many as eight at one time. They were followed by a several firsts including pair of Scarlet Tanagers who were followed by a couple of Turkey Vultures. These were in addition to all of the usual suspects. 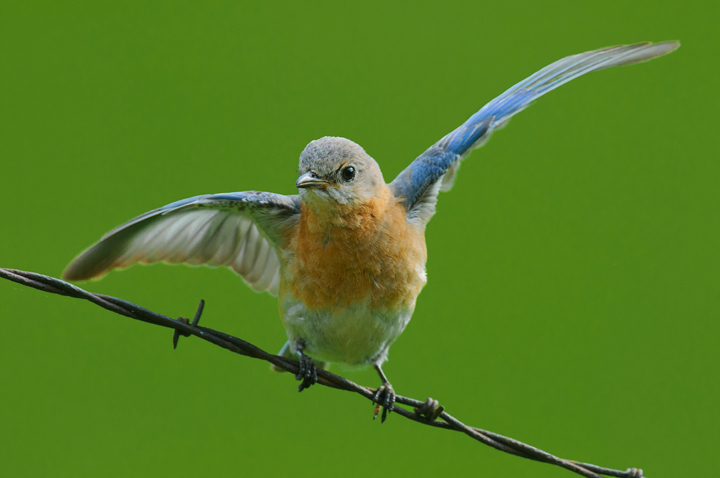 The Eastern Bluebirds returned the third week in April this year. Normally I’m able to get lots of photographs of them when they first return because I use some Sumac Berries to attract them to an area where they can be photographed. This year it didn’t work and they remained an elusive bird and I have fewer photographs of them than in any previous year. 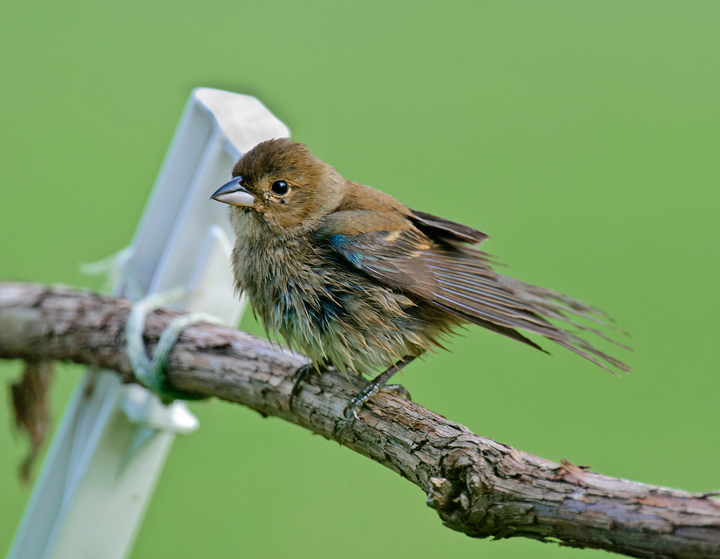 The female was attempting to perch on a wire during a heavy wind. 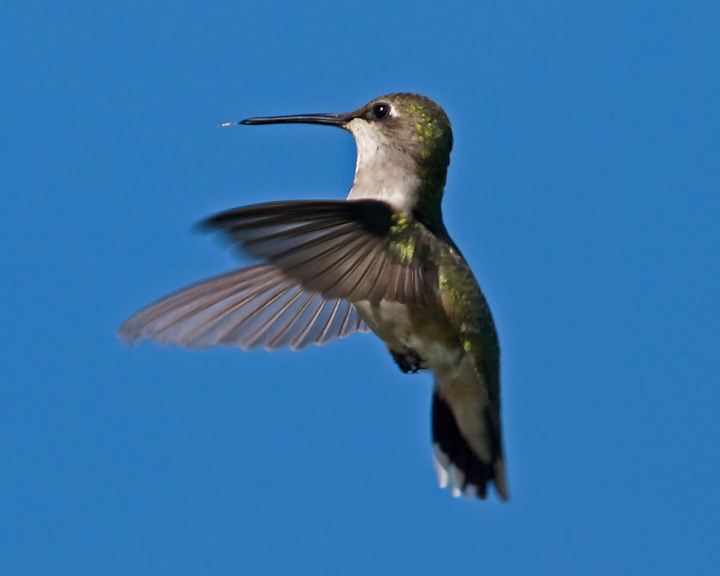 The male was fluttering his wings. 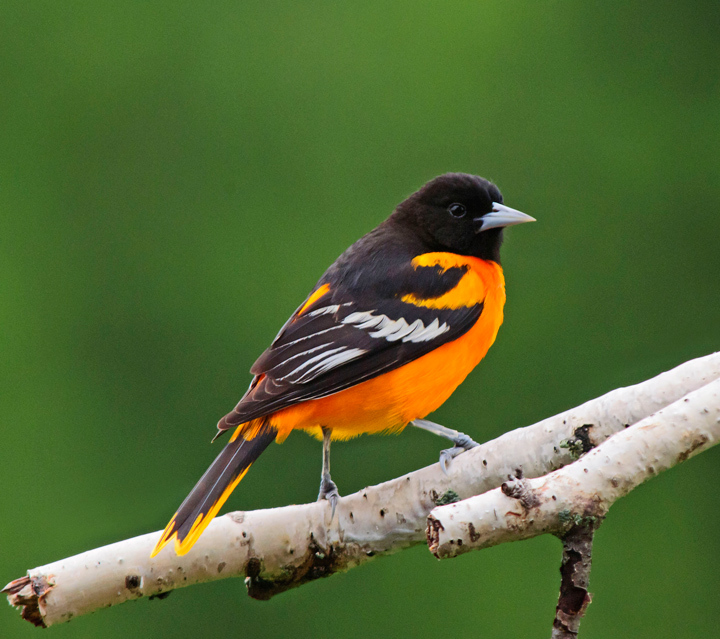 As I mentioned this has been an amazing year for Baltimore Orioles. Normally I have a few of them come to the feeding station around the first of May but this year they came in large numbers. I was going through a quart of grape jelly every couple of days. The numbers appearing at any one time dropped off by the middle of May but they continued to come to the feeder until the end of May. I suspect they leave to raise their young. In past years they have returned to the feeding station in July. 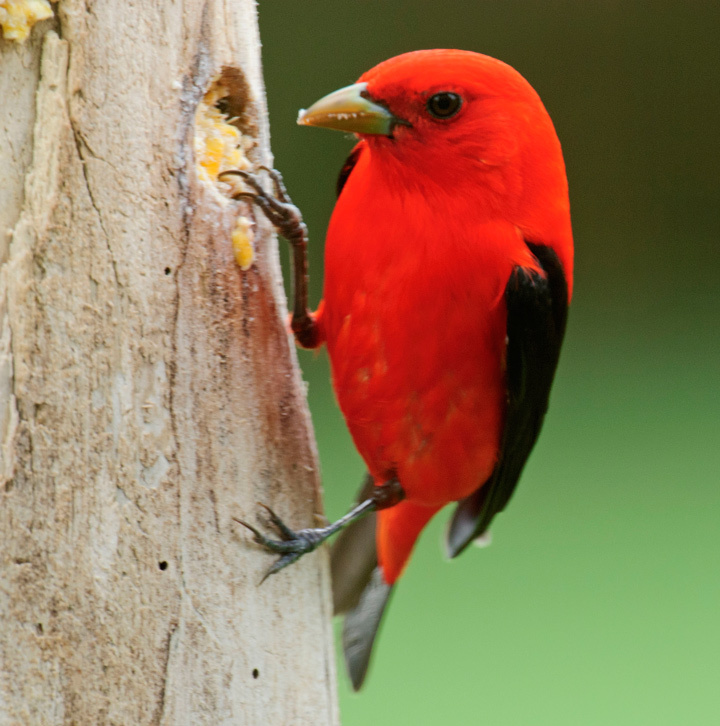 I’ve only seen Scarlet Tanagers a few times in my life and never been able to photograph one. 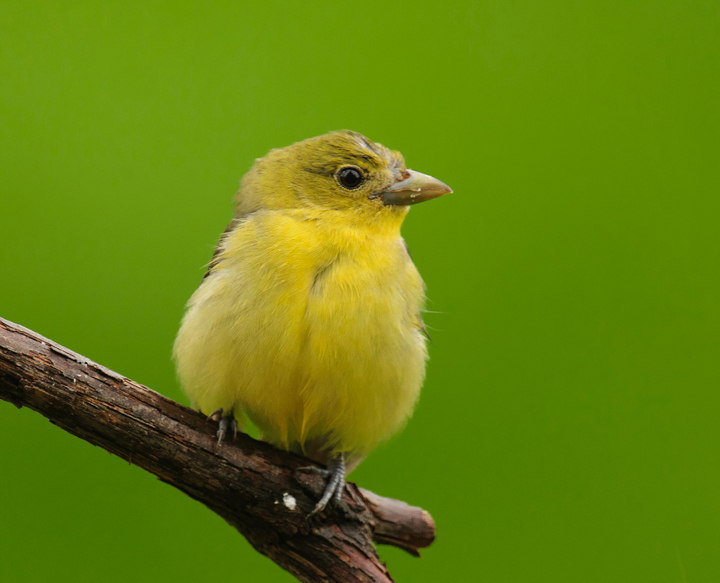 I was shocked when I looked out the window one day and noticed a male Tanager around my feeding station. I quickly grabbed the camera and started photographing him. He came to the feeder every couple of hours during the day. The next day the female joined him at the feeder. the day after that they were gone. It was an amazing experience to be able to see and photography one up close. I usually see them around in the spring. 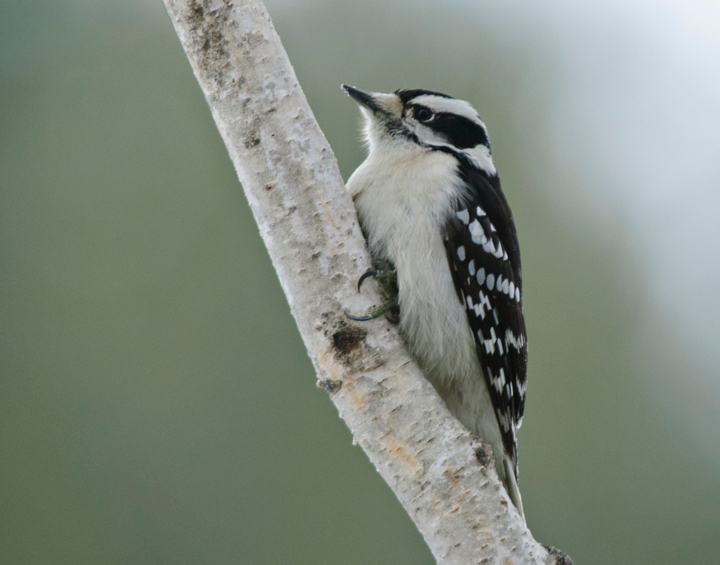 I thought they might be nesting in some of the pine trees near the house but haven’t been able to confirm that. I usually have a few of these around each spring. 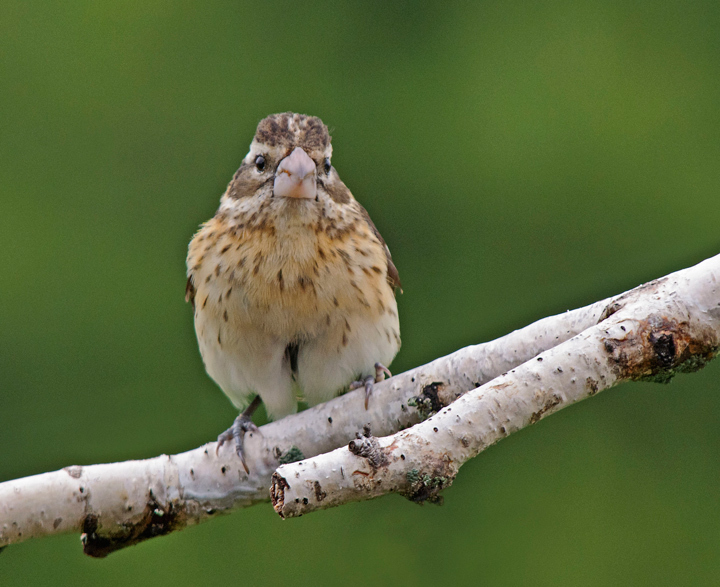 I see these more frequently down in the valleys but sometimes they come to my feeding station for the Niger seed. They are very skittish so about the only time I can get a photo of them is when I happen to be photographing other birds and they show up at the station. The female had just taken a bath. 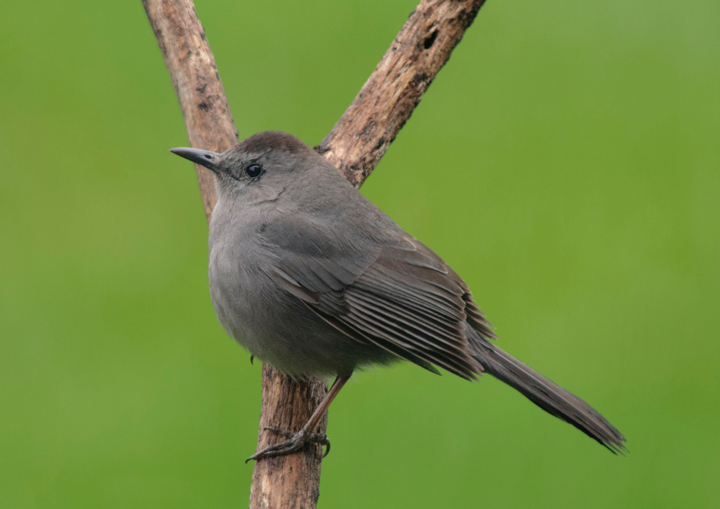 The Grey Catbird usually shows up in the spring. Some years they nest near the house but this year they were around for just a brief time before leaving. 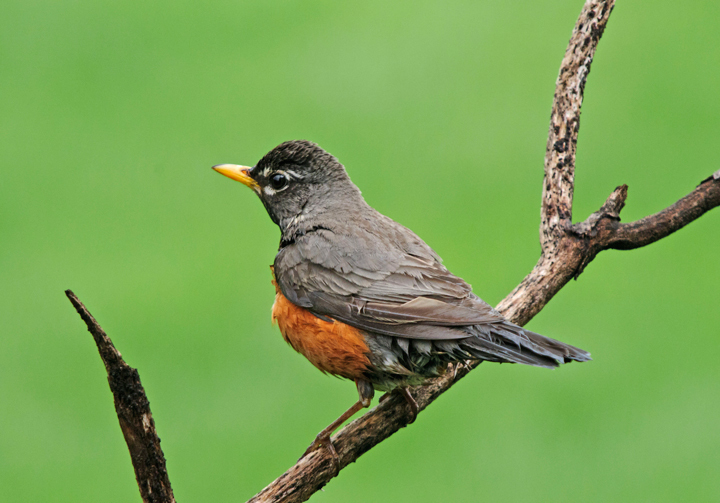 The American Robin usually migrates but with the warming trends can be found in the area in the winter. They usually don’t arrive at my feeding station until April at about the same time as the Eastern Bluebirds. 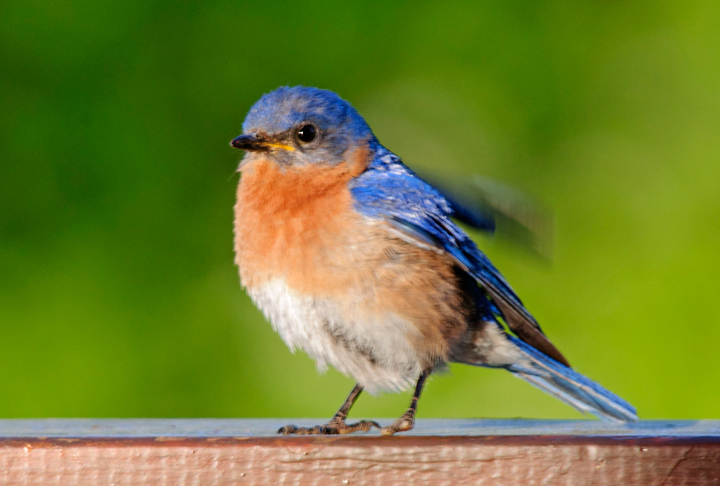 Another spring bird and a frequent visitor to my feeding station. 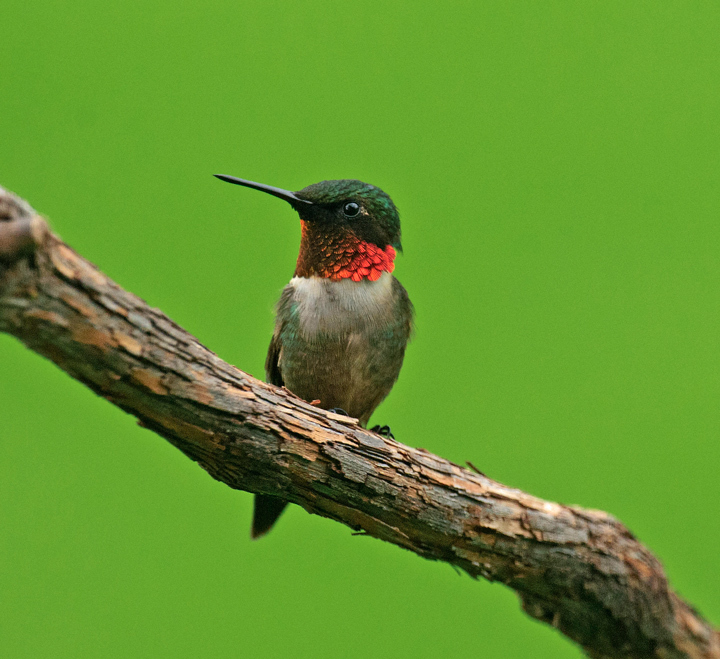 The Ruby-throated Hummingbird usually arrives with the Baltimore Orioles around the first of May. It is usually a project to keep them fed. 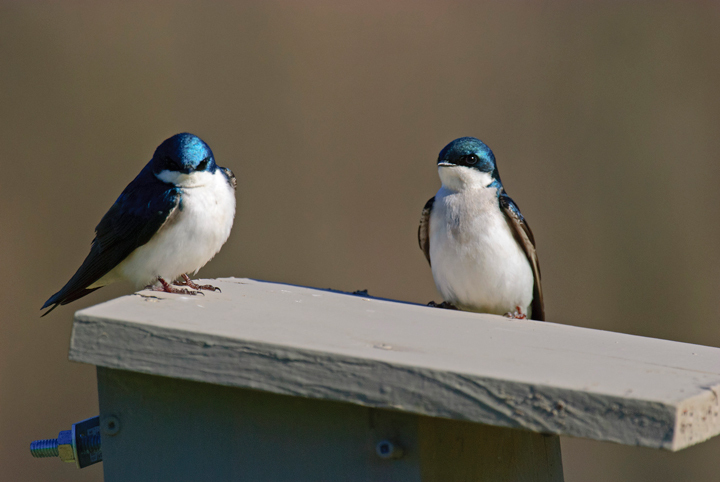 Tree Swallows are a frequent visitor to my farm frequently competing for rental space in my Bluebird houses. The Bluebirds seem to be the first of check the houses out but the Swallows seem to get the houses in the end. 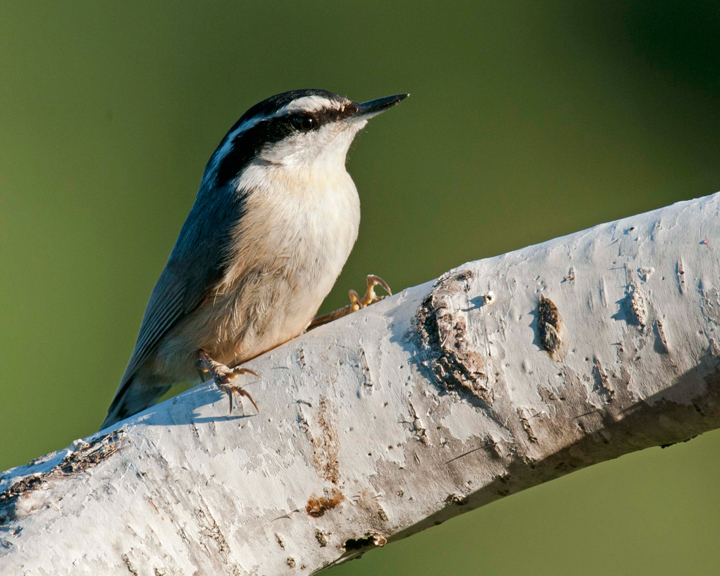 The Red-breasted Nuthatch is an infrequent visitor to my feeding station. One year I had a pair that were around for the winter but that is rare. 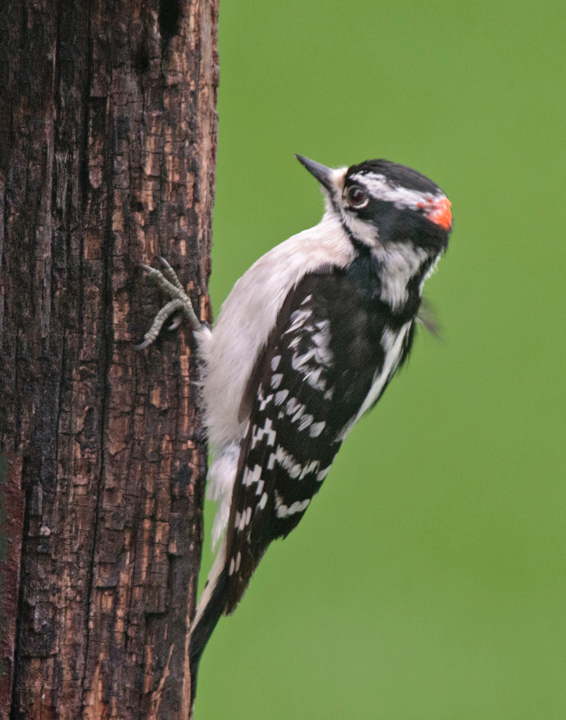 This year I have a female that came to the feeder for about a week and then was gone. I see Turkey Vultures flying over the farm fairly frequently but have never seen them perched. 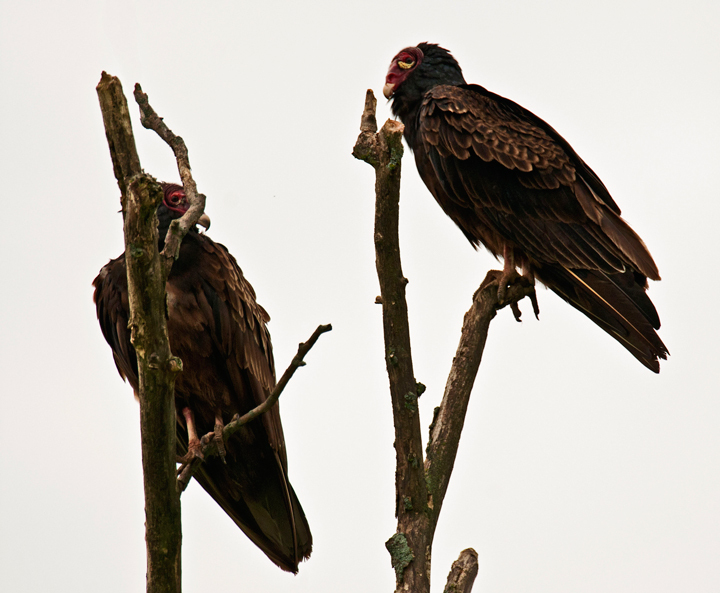 When I first saw them from a distance I thought they were immature Bald Eagles but as I approached the tree they were perched in it became clear that they were Turkey Vultures. I started taking photos and then walking up closer and taking more photos. They let me get fairly close to them. 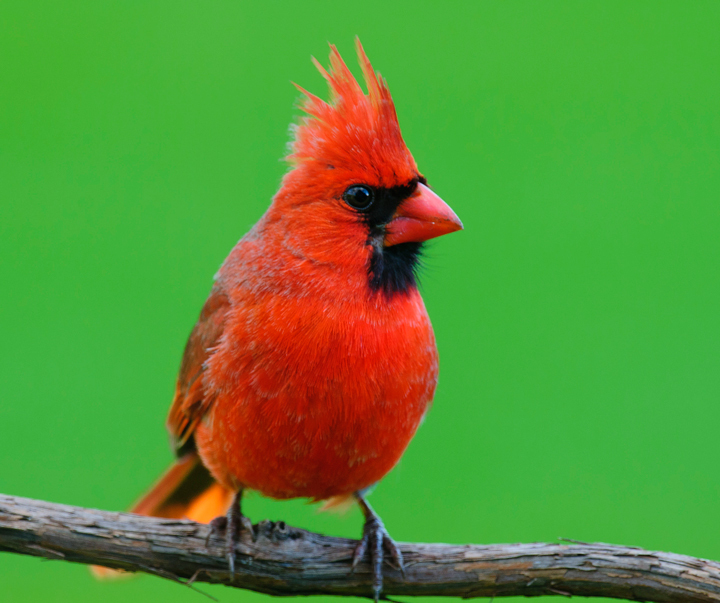 Northern Cardinals are year around visitors to my feeding station and they continued to visit the station again this year. 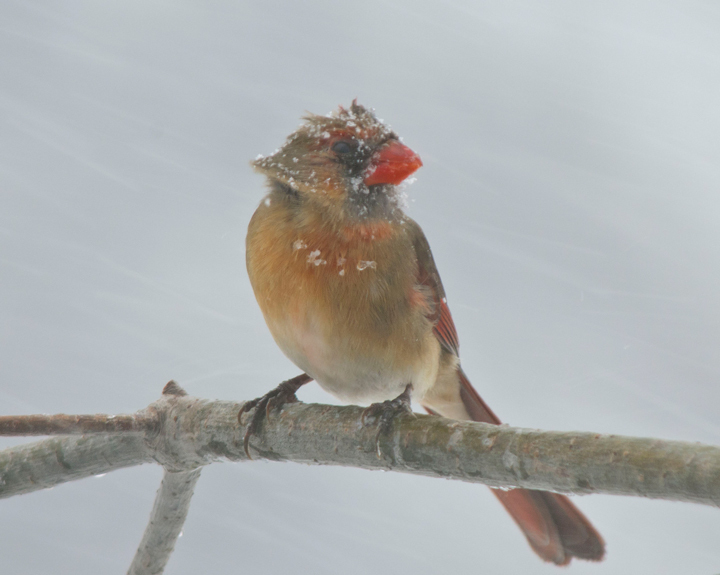 The female was photographed during an early spring blizzard. Mourning Doves are frequent visitors. Normally they spend their time cleaning up the seed that falls on the ground but this spring I did see them perched on my Niger seed feeding station. 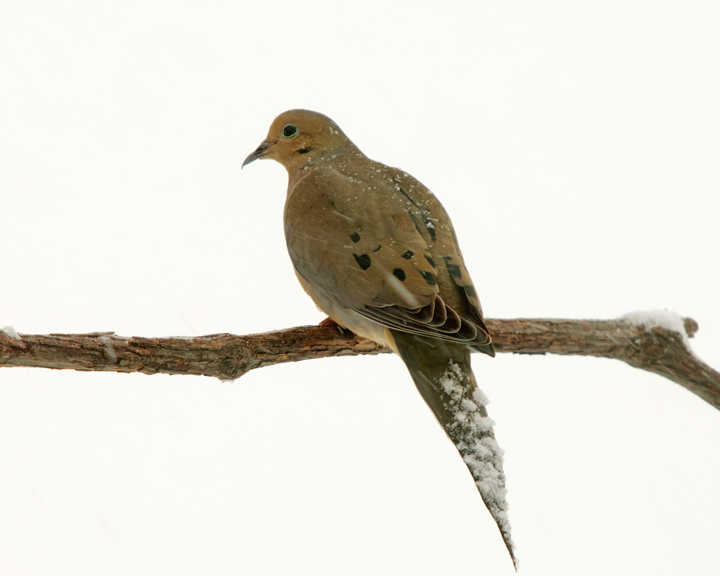 The dove was photographed during the early spring blizzard. 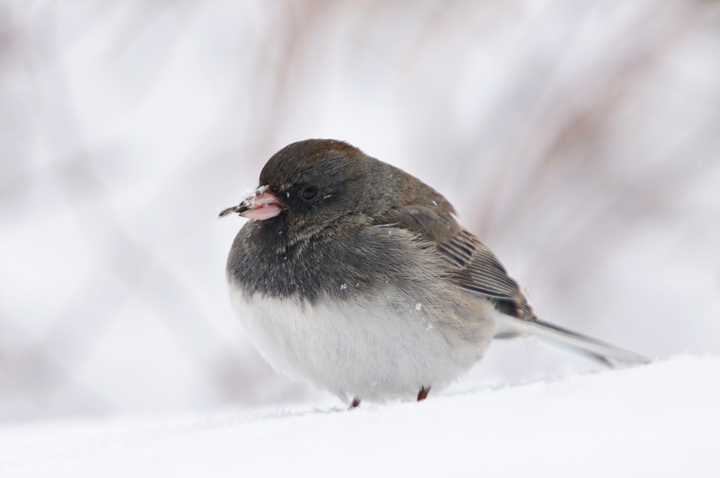 Juncos are normally a winter bird and they leave when the snow is gone. This year we had a late March blizzard so they were still around well into April. 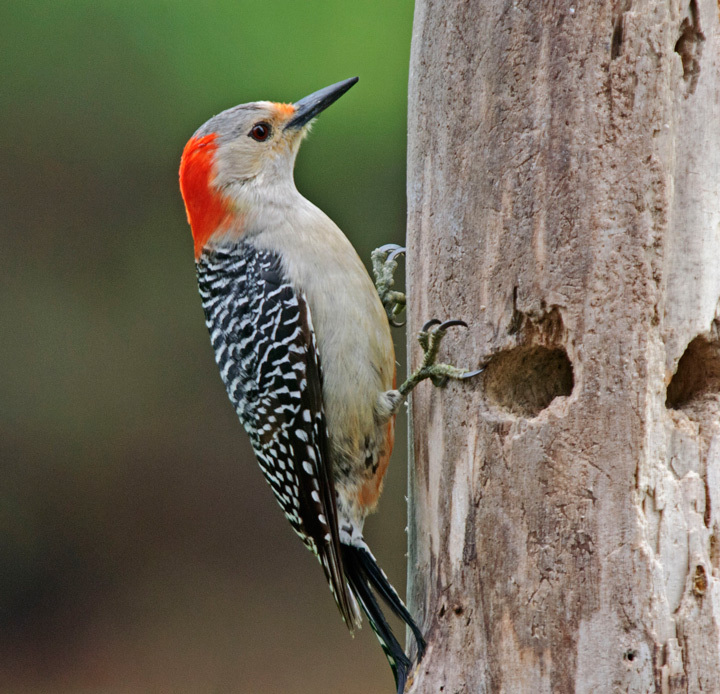 Red-bellied Woodpeckers are frequent visitors to my suet feeders. This year, for the first time, I created a suet feeder by drilling holes in an old log and filling the holes with suet. They really seem to like it better than just hanging suet in a metal cage. 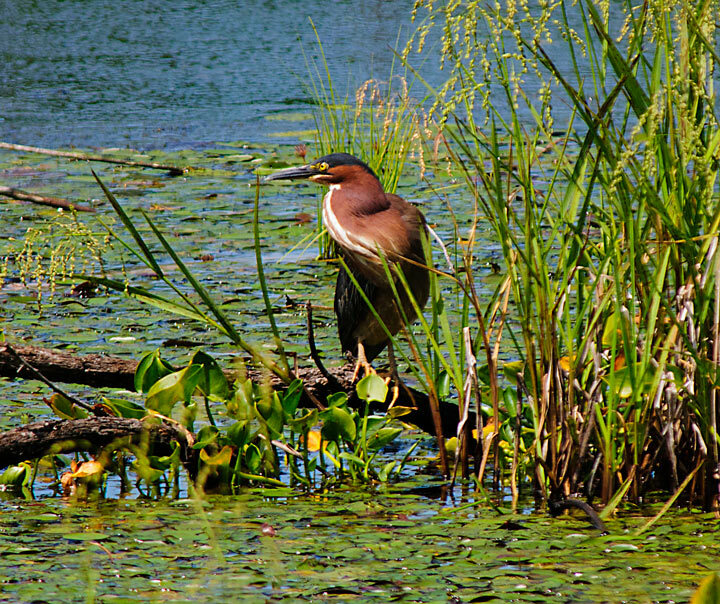 Another bird that is around all year. 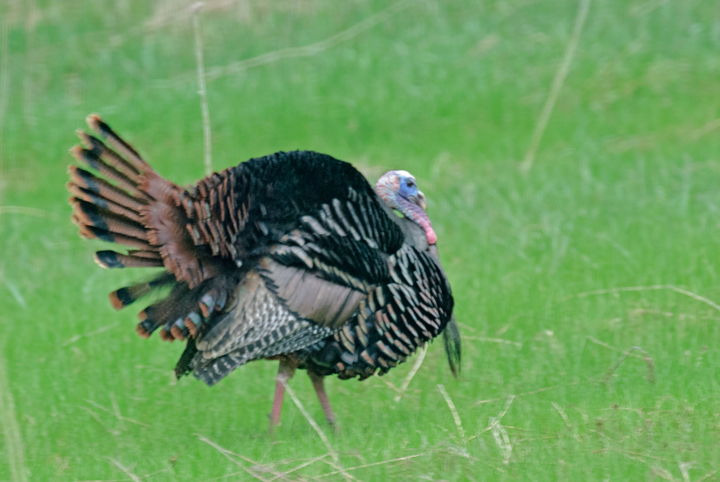 In the first years after they were introduced in Wisconsin I had as many as 50 wandering around and any one time. Since the introduced hunting the numbers are down. I usually see them in the spring before the grass in my prairie gets too long. This year I had one charge me while I was working in the garden. Don’t know what that was all about. A year around visitor. The numbers vary from year to year. Some years I’ve had almost none but this year they have been around in large numbers. I much prefer photographing the females because they have much more interesting colors. A year around visitor to the feeding station. 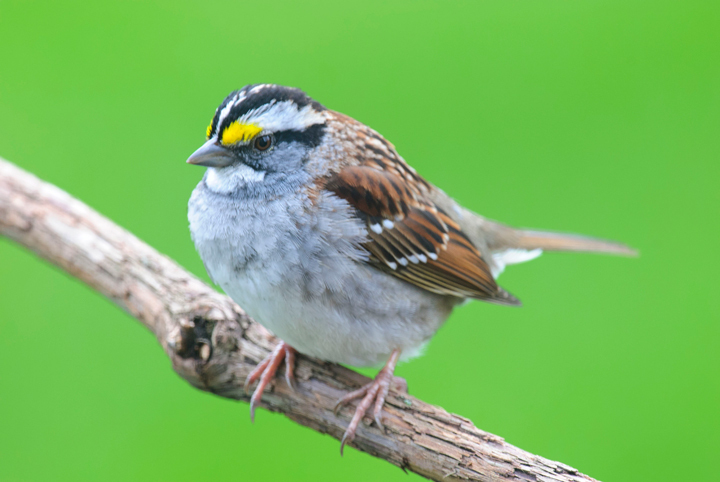 More bird photos can be found at Philip Schwarz Photography. I was thinking the other day about the influence of place on my approach to photography. 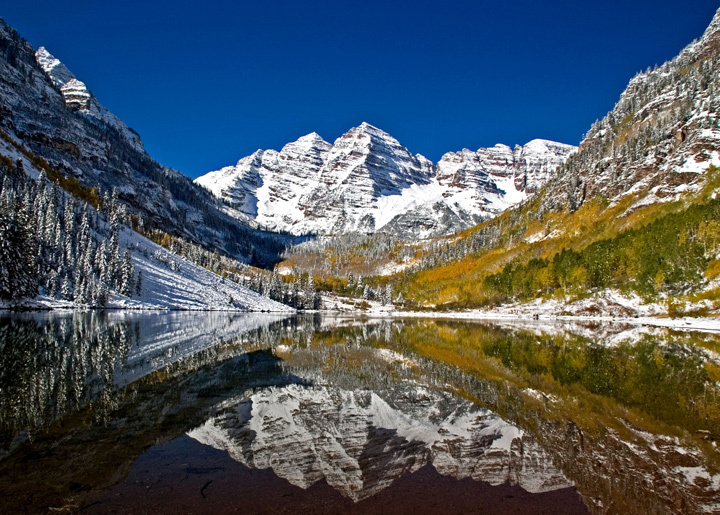 In my early years I spent most of my time in Colorado, Washington State, and traveling the world. At that time I concentrated on landscape photography. More recently I made many trips to the Badlands and Black Hills of South Dakota as well as a number of trips to the Canyonlands of Colorado, Utah and Arizona. I continued to photograph mainly landscapes. After I retired I started to spend more time photographing around my 80 acre farm. There were no grand landscapes to photograph. In fact, I live amongst a pine and hardwood forest so I’m lucky if I can see the sunrise and sunset. This has definitely had an impact on the way I see things to photograph. 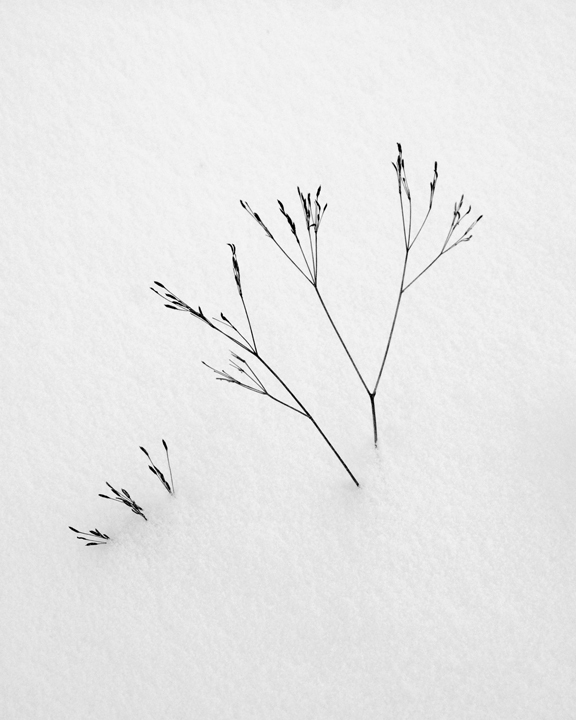 I’ve become much more engaged in looking for and photographing what I call intimate nature. I started out documenting what I saw as a walked around the farm. The more I spent walking the farm the more interested I became in photographing small objects. This lead to the purchase of a Macro lens so I could better photograph insects, small flowers, leaves and other small objects. This interest has carried beyond the farm. As I travel I find myself spending more time in intimate nature photography. Rather than photographing entire waterfalls I spend just as much or time photographing small sections of the waterfall to capture water running over a rock or the sunlight reflecting off a small portion of the falls. I also spent more time watching birds. The more I watched them the more I became interested in photographing them. I purchased a 200-500mm lens so that I could get more intimate photographs of them in their natural environment. 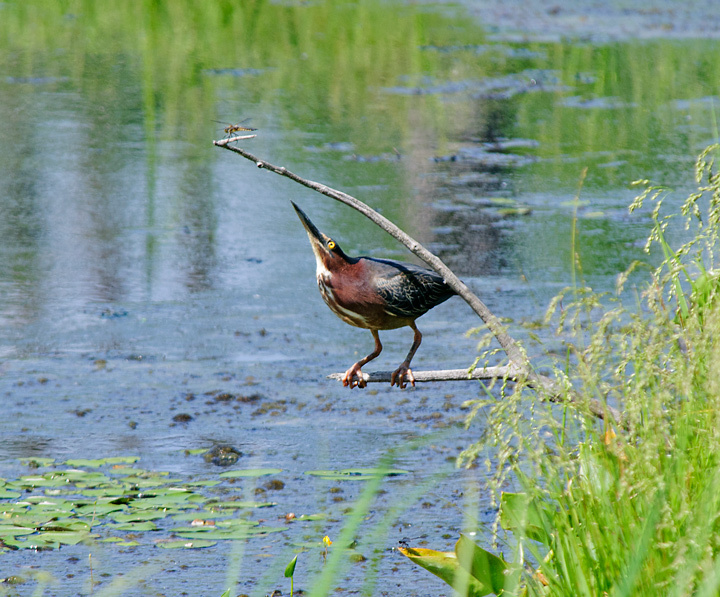 This led to a greater interest in avian photography in general and I started adding wildlife areas to my travel destinations. After a year of photographing around the farm I realized that what I was doing was documenting nature throughout the seasons in one small place on the planet. This also influenced the my approach to photography as I visited other sites. I started visiting the same sites at different times of the year so I could capture the site as it changed throughout the seasons. The farm has also influenced the way I organize my entire website. 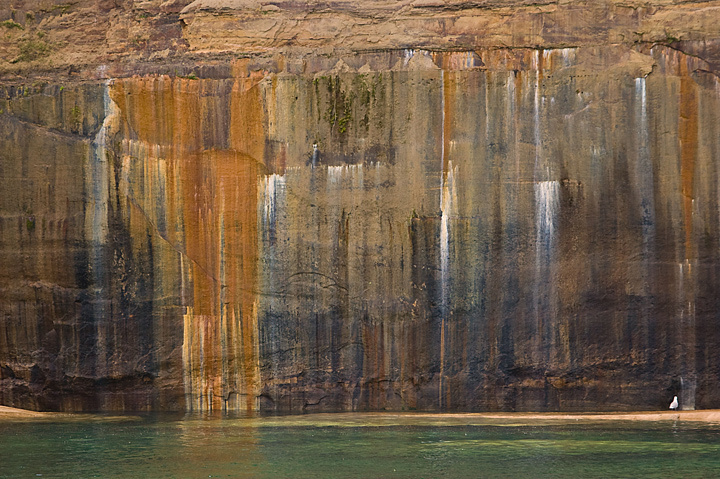 Generally photographers organize their website by topics such as waterfalls, fall colors etc. I’ve arranged my website by location and as I continue to visit many of the same sites at different times of the year I’ve also started to document them by seasons. I would like to feel that viewers of my website can use it for planning trips during various times of the year and be able to see what they might find when they visit the location at a particular time of the year. You can see more of my photography at Philip Schwarz Photography. 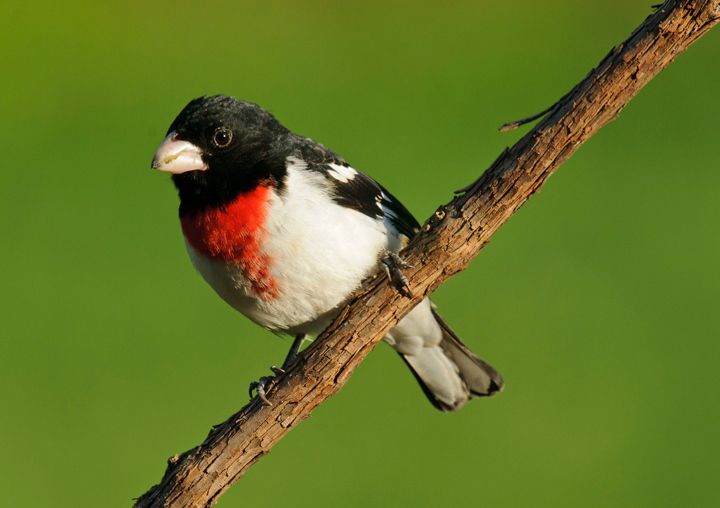 For several years I have used a Stokes Select Giant Combo Bird Feeder purchased at my local Fleet Farm Store. 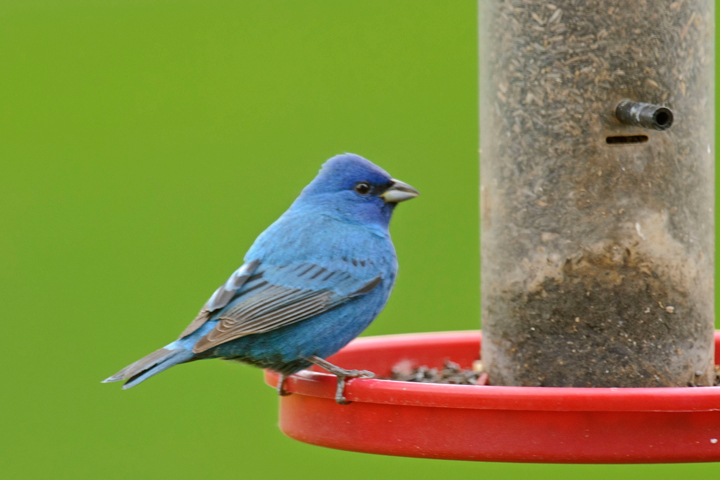 I have liked the feeder because it stands up well, allows me to put a lot of sunflower seeds out at one time and is easy to fill. 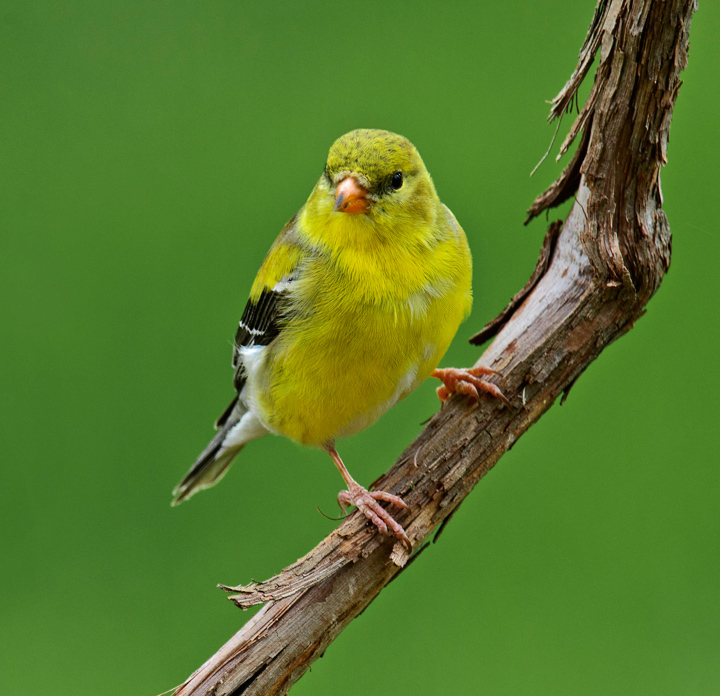 I was gone for several days and after returning I noticed an American Goldfinch perched on the feeder in an odd position. Upon closer inspection I found that the bird had gotten its head caught in one of the feeding portals when it was attempting to reach in for seeds. I suppose if this was a baby crib it would be recalled but since it is a bird feeder I’m not sure anything will happen. It took quite some time to extract the dead bird. It appears that the feed was just about level with the bottom of the feeding portal so it was able to get it head completely in the portal and then couldn’t extract it’s head. This is an update. Today I had a second bird die in this feeder. In both cases the only way to remove the bird was to decapitate it. That’s how bad they were wedged into the feeding portal. this appears to be a serious design flaw that I reported to the company but as is typical of american business I received no response. Another update. I had a third bird get caught in the feeder. This one was alive when I found it However I had to dismantle part of the feeder to get it out. I decided to discontinue use of this type of feeder since it is detrimental to the birds I’m supposed to be helping. 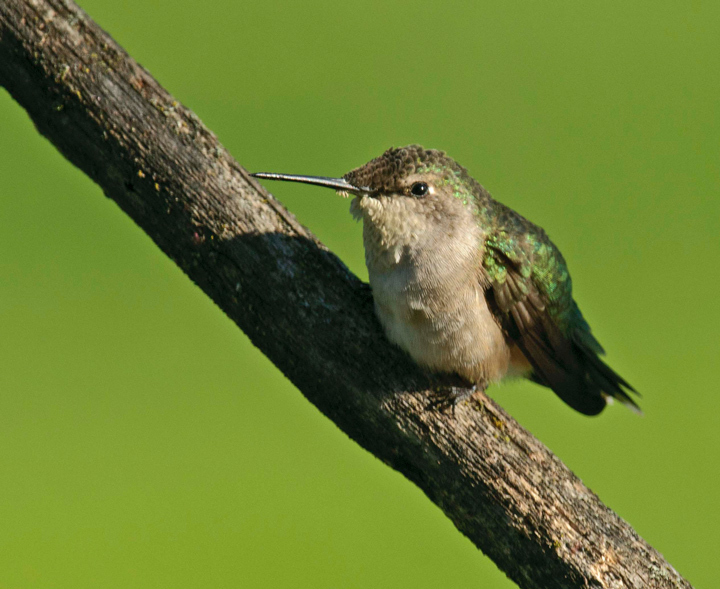 In a related story I also had problems with my Hummingbird feeders. I hung three of them from my rain gutters using bungee cords. It works great but in an effort to make it easy for me to refill them I used a long cord that made it easy to reach the feeders from my deck. When I went out to refill the feeders I found two of them on the ground with the little yellow flowers pulled off and chewed up. One of them had the base unscrewed. Apparently I’m not the only one that can reach them. It appears the raccoons like a little nectar as well. This past July 4th weekend I had an opportunity to get some great birds of prey photos. On Saturday night we took a boat trip on Long Lake (east of Spooner, Wisconsin). 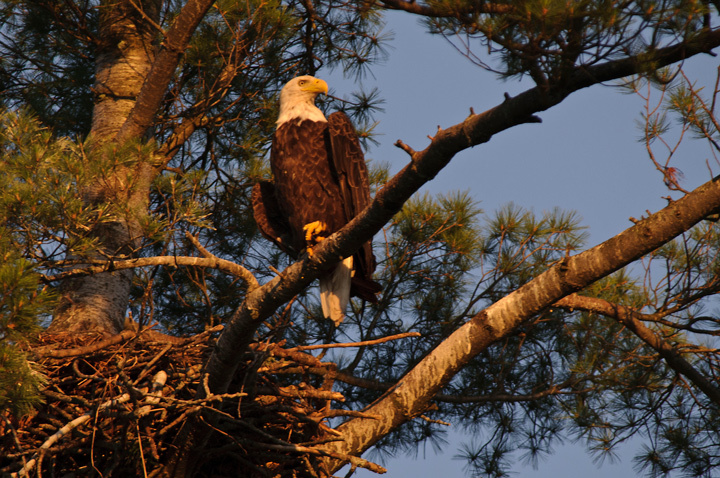 My brother-in-law knew of a Bald Eagle nest that had two eaglets that were about to fledge. 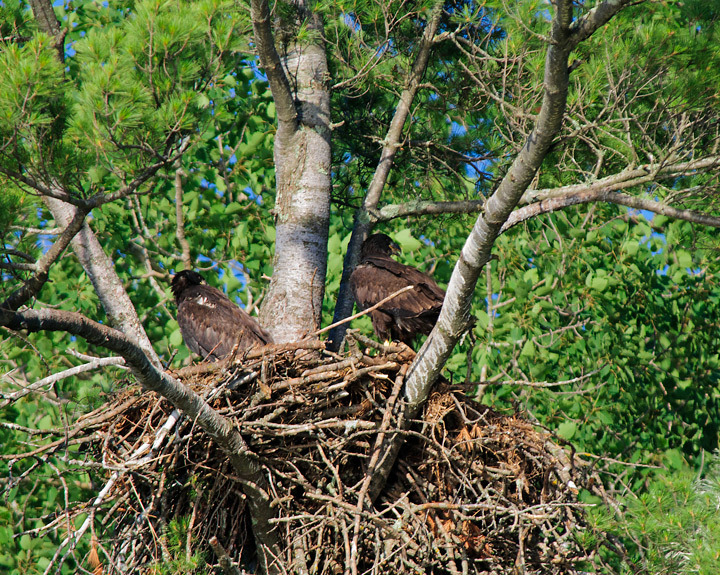 As we boated past the nest there were two eaglets on the nest with an adult in a nearby tree. 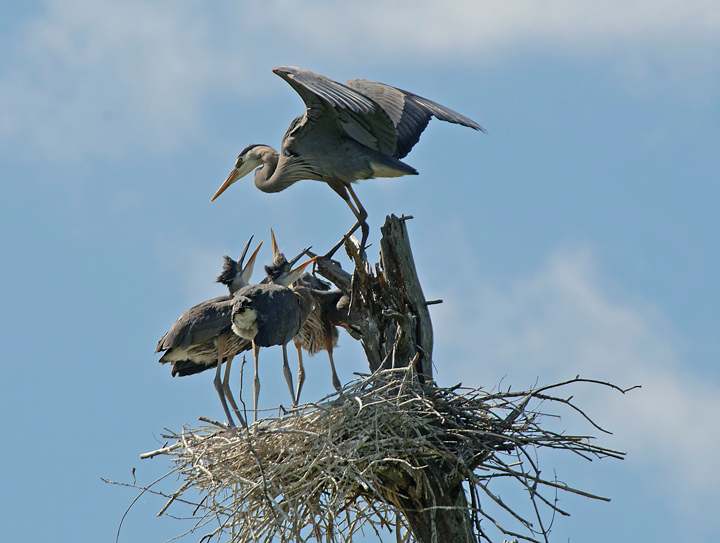 On the way back down the lake we passed the nest again and one of the adults had just brought some food to the nest. The other adult was still in a nearby tree. This nest was not as large as some since it was just built this year. 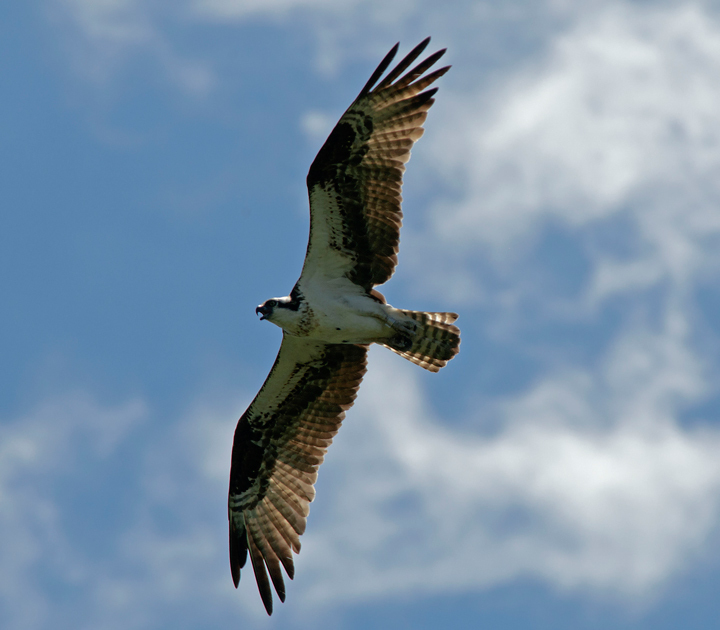 On Sunday we started home and drove past an Osprey nest a few miles from my brother-in-laws house. 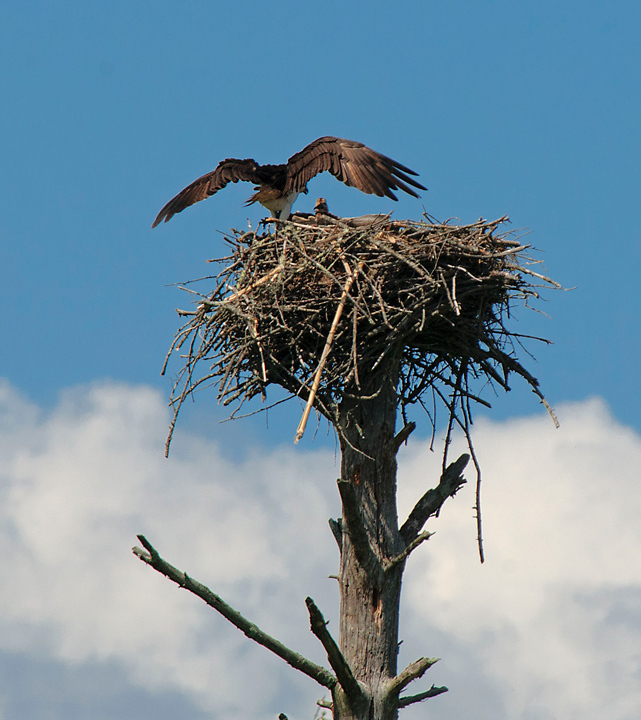 There was one bird on the nest and it appeared to be a fledgling Osprey. While we were watching it was constantly making sounds and flapping its wings. 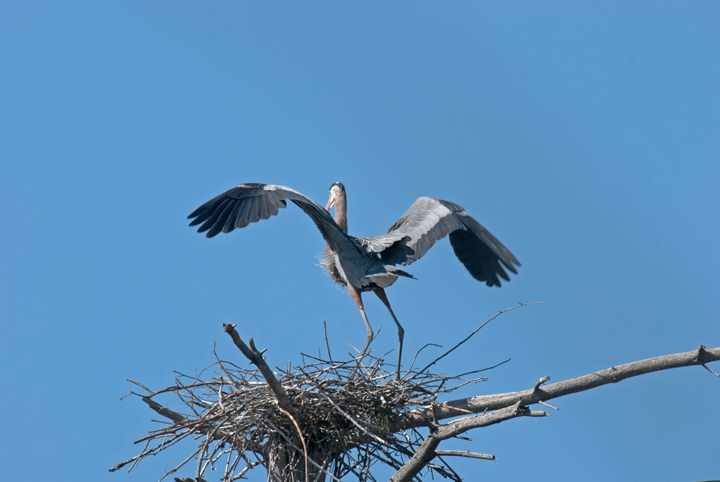 All of a sudden it flew from the nest and circled above. It would circle for a while then land. This went on for quite a while so we concluded that it was a fledgling practicing takeoffs and landings. 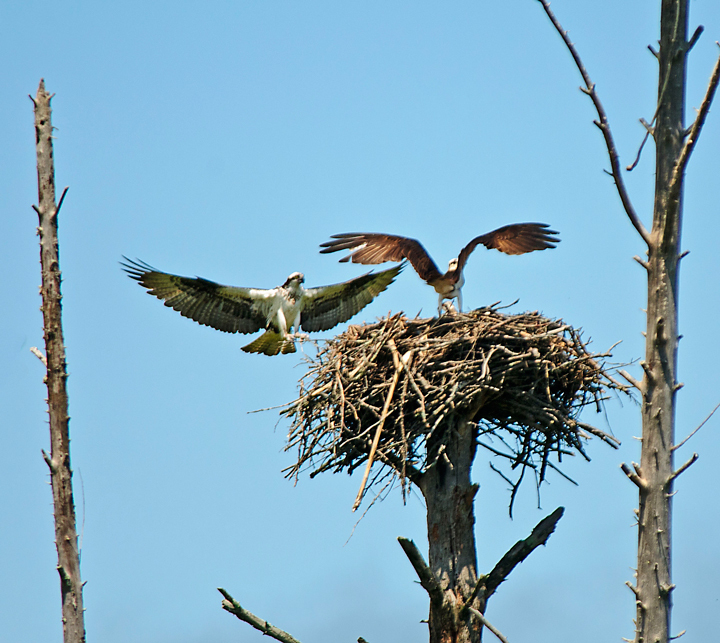 Later in the day we drove past Island Lake Rookery to view another Osprey nest. There was one adult in the nest with some young still in the nest. The second adult was in a tree not far away. These young seemed to be quite a bit smaller than the one we had seen near Long Lake.